Well-regarded in the industry for high, reliable gene expression, SBI’s lentiviral vectors come in a variety of formats that support a wide range of applications. 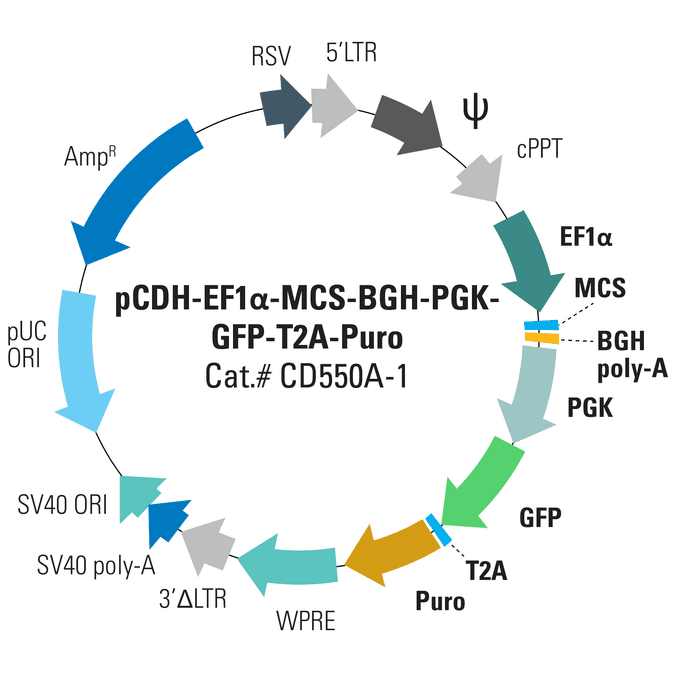 The pCDH-EF1α-MCS-BGH-PGK-GFP-T2A-Puro Cloning and Expression Lentivector drives expression of your gene-of-interest from an EF1α promoter, and co-expression of GFP and puromycin resistance from a PGK promoter. The addition of a BGH poly-A site in between the MCS into which you clone your gene-of-interest and the downstream PGK promoter enhances EF1α-driven expression of your cDNA clone.